When I got my first good look at the coyotes’ fur it was about as lackluster as the winter-burned grass in which the two coyotes lay, rubbed almost to the skin. I was not surprised, nor was I disappointed. In fact, it did nothing to wipe the grin off my face. 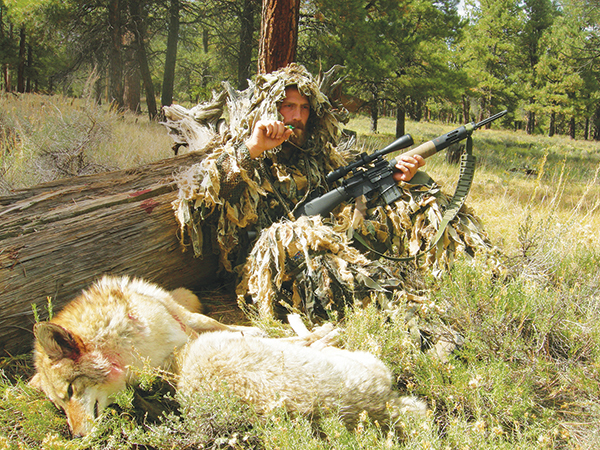 Why would a one-time fur buyer shoot a pair of mountain coyotes in April when the fur is worthless? The previous evening, while trying to roost a Merriam’s gobbler on a ridge above a Forest Service road, I came upon the carcass of a freshly killed mule deer. It looked like she had been hamstrung, and then the coyotes had gutted her to get at the twin fawns she was carrying. That got my dander up, and when I slipped into the area well before daylight the next morning, my turkey vest also held a coyote howler, a couple of predator calls and a half-dozen 3-inch magnum loads of copper-plated No. 2. I stopped half a mile down the road from the doe kill and cut loose with a lone howl that was answered almost immediately. I set up 300 yards or so down the ridge with a freshening breeze in my face. As soon as I could see well enough to shoot, I cut loose with a bark-howl figuring the pair would not tolerate another coyote encroaching on their territory. I got an immediate answer and howled back at them. A few minutes later, the pair came running along a cattle path on top of the ridge. I let them get within 20 yards before flattening both. Maybe they weren’t worth anything on the fur market, but they weren’t going to hamstring any more pregnant does. Nor would they teach a litter of pups to do the same. While I had been waiting for shooting light, at least two gobblers had sounded off down the ridge. With the coyote business settled, I went turkey hunting. By this time of year, coyotes are paired up and defending established home and denning areas, making them intolerant of intruders, which also makes them susceptible to a caller who can mimic challenge howls and barks. On the downside, most of the young and dumb have been shot, and the wily ones that remain are pretty well educated. I’ve found that getting up close before calling is the best way to go after late-season coyotes. They may have been listening to enthusiastic if not always believable predator calling since last October, but if you can let loose with a howl right on top of them, they tend to respond in a knee-jerk fashion. Full-body coyote decoys can be a real asset when trying to pull these canines into gun range, though they are a pain to tote around. 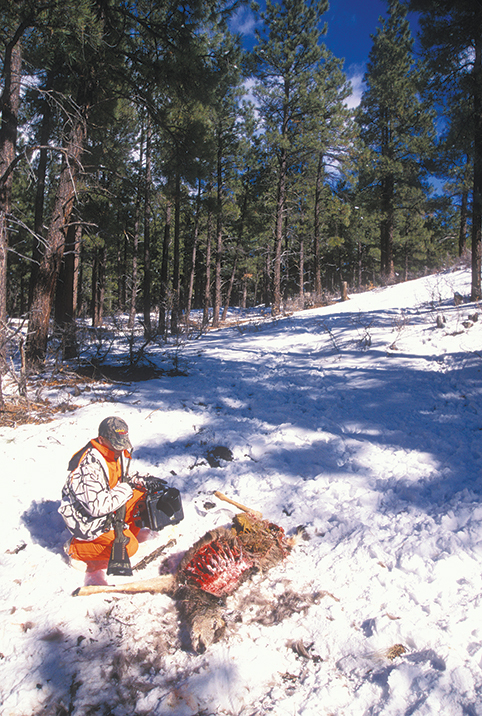 Most hunters believe winter is the killing season, when coyotes take the heaviest toll on deer and other game animals. This can be the case when and where a severe winter piles up deep snow. However, across much of coyote country, spring is when the coyotes really feast. The doe deer are either heavy with young or birthing. Either way, they are vulnerable. Same is true for livestock out on the range. Those who only hunt during the fall and early winter when fur is prime may like to think that they are managing a local coyote population, but they are only kidding themselves. Coyotes roam, and there always are newcomers to occupy prime habitat. If you want to make a difference for the local game animals and ranchers, you have to hunt when the coyotes are actually doing the damage. The fall and winter of 2013-2014, the partner on my Iowa whitetail leases trapped 23 coyotes and several red fox, the goal being to cut down on the number of coyotes prowling and howling around our food plots, ruining the clients’ morning and evening hunts. I and our guides managed to shoot a few more. It worked, especially in the trapped areas where the number of coyote sightings by hunters dropped to zero. After the season, we let several local hunters call on the properties and even let a few run the coyotes with dogs. Before last season, as we scouted for the upcoming hunts, we heard as many coyotes as before and probably saw even more. So we went back to in-season trapping and hunting. Back when I was a Colorado conservation officer, a rancher who had just lost nine newborns in his lambing yard called for help. The coyotes only ate two leaving the rest to rot. My job description didn’t include predator control, but I simply couldn’t pass up such an opportunity. That evening (on my own time) I set up under a cedar several hundred yards from the lambing pen, figuring the coyotes probably had a den in one of the deep ravines on the far side of the valley. I also figured the coyotes would be on the hunt toward evening, and if they heard another coyote near their killing ground, they’d respond aggressively. Several weeks before, I had been out with a government trapper who used his voice to howl up a pair of sheep-killing coyotes. I had been practicing my own howling ever since. However, I had found if I used the bell from a trumpet with a modified open-reed Olt duck call, I could make better-sounding howls with much more volume. The coyotes answered my first trumpet calls, and within minutes a pair was running all out for my position. I shot the female at 50 yards and then dropped the male when he stopped at 200 yards to consider a ki-yi I had thrown his way. That not only ended the rancher’s lamb losses for the spring, it also gained me permission to hunt a choice piece of property in good elk country. Never did take the opportunity to hunt elk, but over the ensuing years I took a number of prime mountain coyotes off that ranch, calling in season when the fur was at its best. I always made it a point to keep hunting late into winter and early spring near the lambing yard, and the entire time I hunted there, the man did not lose another spring lamb to coyotes. Farmers and ranchers are more approachable in the off season, and if you help them out with a predator problem, you might be surprised how easy it is to get permission to come back in the fall for small game, birds or even big game, as well as some prime-time fur. A widowed rancher lady called me late one winter to tell me all 13 of her barn cats had come up missing. I got curious and drove out to see what was going on, figuring coyotes were the culprits. But tracks in fresh snow indicated that a big tom bobcat was working the place. A haymow in the barn held the cached carcasses of most of those cats. A creek bottom choked with dense willow ran a few hundred yards from the house, and on the off chance I might be able to entice the cat out of that cover, I set up under a cedar and commenced filling the late afternoon stillness with cottontail squealing and squalling. Ten minutes later, I made out the silhouette of a very large bobcat. I stopped calling, and after a short pause the curious kitty stepped out into the open. A 50-grain slug from my .223 ended his killing spree. The pelt was still good, too, and I enjoyed several years of trapping and calling on that ranch, not to mention the trout fishing in her lake and in a stream that crossed the property. Spring predator hunting is a great way to get kids into the game, and pairing it with a turkey hunt can make an unbeatable combination. The only thing that gets a youngster more excited than hearing a thunderous gobble is seeing a coyote coming on the dead run. On a number of occasions, I’ve had to remind clients that we are there for spring turkeys, not the over-eager coyotes that came to check out our turkey calling. Last April, I was calling for a client on the opening day of Iowa’s turkey hunt. It was miserably cold with the usual wind, so we’d set up along the protected edge of a harvested bean field adjacent to a wooded slope overlooking a creek bottom. I’d taken gobblers there before and had set out three decoys right in front of us. A gobbler stepped out into the open 100 yards across the field from us and began strutting back and forth, gobbling to my every call. Just when it looked like he was coming, several hens flew down into the field and drew him away. Then a coyote stepped out of the creek bottom brush, and my client jumped about a foot when I started squealing on the diaphragm call. I told him to sit tight until the coyote got close enough to take him with the turkey gun. The coyote started our way, but at 20 yards veered suddenly and slammed right into one of the decoys. It grabbed the head off the decoy and took off with it like a scalded cat. At about 50 yards it stopped and spit out the plastic. Then it really kicked into high gear and was gone. My client was speechless, hadn’t even begun to lift the shotgun. Me? I was laughing so hard I nearly swallowed the diaphragm call. Bet that coyote thinks twice before attacking another turkey, and I also bet my client never tires of telling the story. A few states classify coyotes as furbearers and close the season at the end of winter. But most don’t, rightly classifying coyotes as predatory varmints to be hunted year-round. In areas with late deer seasons, the only time you may be able to get on private land for a coyote is in early spring after the deer hunting shuts down. Then landowners may welcome you into their properties. Yes, the fur is worthless. But early spring coyote calling has a whole lot more going for it than against it. If you only call when the fur is prime, you can miss out on some great hunting action. Take care of business now, and you will likely be welcomed back when the fur is prime. The coyotes will come back. They always do.